Valentine’s Day is almost here and I don’t know which gift will flaunt him/her away! Yes, we have heard this over a thousand times. The Valentine’s Day has always been a special day for every couple. Be it a small gift or a magnificent one, any one of them will surely make your partner feel loved and cherished. It is not about money!. In many cases, people think of giving their partner a valuable gift and in return expect them to flatter with immense joy and happiness. But, this will not happen every time. On the other hand, a sweet little handmade gift of candies or anything else can make their mood fly to next orbits filled with deep caring love. Here are some DIY Valentine’s Candy Gifts, which are absolutely affordable and can be made within a matter of minutes. So let’s get started. You might have used glue in your day to day life but will surely be quite unaware of its other uses. For bringing something diffferent, this valentine, Conversation Heart Slime can be the perfect DIY to make. This DIY can be made from a mixture of white glue and a liquid starch mixed in a proper proportion. Further, for giving it an attractive look, candies are added as a topping and it will surely be loved by your partner. This DIY is affordable and at the same time a unique gift to give to your loved ones or partner. Read the tutorial. Every loving couple is a magnet for each other. Their sensational love bond makes them attached to each other, no matter what the condition is. This Valentine, make that bond stronger with the conversation candy heart magnets. Be it any type of love letter or a small love note, use this unique DIY gift to make it attached to the wall. Your partner will be cherished when reading this unique DIY and will uplift their mood to exciting boundaries of glory and happiness. Click here to read the tutorial. In this digitized world, every one of us has seen different tags on Instagram, being the photo giant of this present day industry. But, how about making some unique heart tags for your partner this Valentine’s day? It will be a unique experience on its own. The Conversation Heart Gift tags can be made in different colors and a variety of customizations can be done to them with far ease. You can also include these cute tags with a bigger gift and let your other half feel your love as a reflection through this DIY. Read the Tutorial. Candies are eaten by almost every individual, be it a man or a small kid, say candy once and everyone will be rushing towards you to take their first bite. Bringing an innovation in Candy, The Valentine’s Day Candy Terrariums will be the perfect gift for your soul mate. Use a jar, fill in with some candies, decorate it to an absolute level of perfection and hurray, you have made this unique DIY within a matter of minutes. Tempting to make one? Click here for the tutorial. Every one of us knows Rocks and their uses in our day to day life. But, besides everyday usage of a thing, there is certainly a decorative side too. This Valentines, surprise your partner with the Calcite Rock Valentines which will make their valentine’s day rocking with this DIY. For its making, calcite rocks are used and they are easily available in many shops. Further, you can make a cute little heart from paper crafting, attach this calcite Rock and write majestic slogans which will make them fly with excitement and joy. Read the Tutorial. Lollypops are the best foods for any kid. No matter how many you give them, they will consume it with whole joy and happiness. But, a little innovation in this stuff can be a unique gift for your partner this Valentine’s Day. Yes, the Rose Lollypops area beauty on its own and will be a beast of a gift for your soul mate. Roses are available in plenty but a Rose shape made of lollypops? It is quite magnificent and stunning. Making of this DIY is quite simple and exciting. Click here for its making. Many of us have used jars for storing daily stuff but very few would have thought of making this jar an exciting gift for their partner. Bringing in a transformation, the Ombre Heart Jars Filled with Candy is a gift everyone would have wanted at least once in their lifetime. You do not need to include any rocket science in this DIY’s creation as it is made from a handful of materials. For more decoration, you can include some colorful paper-crafting flowers to magnify this DIY; s beauty as well as your partner’s mood. Read the Tutorial. Anyone of us can buy a box full of candies and present it in front of our loved ones. But, candy boxes which are made of love and are all handmade spark a different sense of love which is not explainable by words. After presenting this DIY to your partner, he/she will be filled with love by seeing your efforts and choosing to make one on your own rather than buying one from the store. In the end, it is all these little things that count and makes our love stronger. Read the tutorial. You must have stolen your partner’s heart one the first day itself when both of you fell in love. That moment of love was surely breathtaking and worth remembering. But, this Valentines, revive that moment with the Steal Your Heart Lollipop Valentines. Relive of catching your partner seeing this unique DIY, smiling all way like an idiot and giving you a tight hug in return. Well, surely you must be dreaming of all the above moments. Thus, click here to read the tutorial on this exciting DIY. Cards are a great gift to give to your loved ones be it any special day. Cards are a necessity and are still given as a present in the 21st century. Well, to move a step forward, Candy Heart Cards can be the best Valentine’s gift you can give to your other half. A simple card stuffed with all those colorful candies will surely generate a spark in their eyes and tempt them to love you more after the Valentine’s Day. Making of this DIY is convenient and if you want to make one, click here for the tutorial. You say cotton and everyone will think of a cotton suit in their mind. But, with the Cotton Candy Valentines DIY, thinking’s will be changed and a new gift will be invented which was not known to many of the people. In this DIY, you can do a number of customizations, from coloring that cotton to hanging small candies on it. You think and hundreds of customization can be done with ease. Hence, Surprise your partner this valentine, by reading the tutorial on this exciting DIY. Garlands are used extensively in Christmas but no one would have thought of making a garland with Candies. You can bring a revolution if you are ready to make the Candy Heart Garland. This DIY will be similar to Garland but will constitute of colorful and attractive candies. You can hang this DIY on your walls and let your partner see it with immense joy and happiness. Nothing can be a simple gift than this one for sure. Well, want to make one for him/her, Click here. The Candy Heart Succulent Pots will be an evolution of the present day pots. If your partner is a fanatic of planting flowers in a pot, no other gift will be thrilling than the Candy Heart Succulent Pots. This DIY can be made in minutes and can uplift your partner’s mood to new heights of happiness and glory. Also, you can also color those pots to make it a center point of attraction for your soul mate and spread candies all over for further garnishing. Click here for the tutorial. Heart gifts have always undergone a revolution right from the advent of DIYs. Moving one step further and including further innovation in the list of DIY’s, Candy Heart Love Bandit will be a gift of par excellence. This DIY can be customized in the shape of any animal facing and can thrill your soul mate to unbelievable boundaries. Either, you can also add some soft cushioning material for more warmth and comfortable. Among your extensive list of DIY’s, include this DIY and make their valentine’s day full of love. Read the Tutorial. Chocolates, the number food for all those meal skippers and surely, your partner will be one of them. This valentine’s day, make your soul mate’s day a bit chocolaty with the Colorful Chocolates candy DIY. This DIY is free from all limitations and can be molded in any form to make it best gift you can present to him/her on valentines. For more innovation, you can even create chocolates of different exotic shapes and fit it in a mold of heart which will look stunning on its own. Tempting to make one? Click here. Go to a cake shop and ask for a cake full of candies. Their given rate will surely blow off your pockets and will turn out to be an expensive gift. However, if you genuinely want your soul mate to feel loved and cherished, making a Heart Candy Box Cake on your own will be a great option. This cake can be filled with creamy chocolates with a garnishing of colorful candies for making it, a perfect beast present for your partner. Let your partner feel the lust of this DIY by clicking here to read the Tutorial. Boxes come in various shapes and sizes but a box made of a heart shape, It symbolizes love no matter how small that box can be. This Valentine’s day, flaunt your partner with the unique Heart Candy Box. Giving those candies all open will not look much enchanting as a Heart candy Box will. Fill in your emotions in those boxes, cover it with your warm love and surprise your soul mate to limitless boundaries. Try making one by Reading the Tutorial. Till now, every one of us must have known the use of test tubes in science laboratories. But, this DIY will help you find the third dimension to the occasional use of a test tube. Well, wondering to do something unique, which you haven’t done in your entire life for your partner? The Test Tube Candy Gift is something to look for. It is the most budgeting valentine’s gift, can be made in a matter of minutes and is filled with colorful candies. Go ahead in making this tutorial by clicking here. Imagine your partner opening your handmade envelope and finding some majestic candies with a love letter? Yes, you will be amazed by their happiness and it will make you think that they are the best thing that ever happened to you. Envelopes are a great choice of a gift especially the handmade ones and filling it with some delicious candies will definitely be a cherry on top of a cake experience. So, what are you waiting for? Get in the mood, make one for him/her and make your Valentine’s Day cherishing. Read the Tutorial. If you are an artist and want to reflect your love this valentine’s for him./her, nothing can match the beauty of Heart painted Candy box. This DIY can be a great gift for your soul mate and will outshine your artistic talent in some magnificent ways. Setting up the mood of your partner will never be majestic than making this DIY and presenting it to your soul mate. Also, this DIY gives a perfection to customize your painting, draw their favorite stuff and pack it with some delicious candies. Read the Tutorial. This word of technology has also given a rise to gifts more in a digitized format. Be it any printed mug or a candy bar wrapper, you say and they will be printed for you within no time. With such digitization, the Printable Candy Bar Wrappers is the perfect DIY to surprise your partner in the 21st century. You can customize this DIY according to your need. Design some ones with your creativity, fill in their favorite candies and make them feel loved with this DIY from you. Read the Tutorial. Cups- a stuff which is important when we drink tea or a coffee early in the morning and using these Cups for valentines Gift will be a unique experience on its own. Yes, the Valentine’s Day Candy Cups are the gifts worth making. If you are someone who wants minimum efforts in making a gift for your partner, this DIY is the best-loved choice for you. Make one, fill in with some candies and raise your partner’s happiness to the apex. Read the Tutorial. Your soul mate might be expecting some unique gift from you this valentine and you know it really well. For simplicity and a majestic gift, the Heart Candy Box is the best from the lot. In this DIY, decorate your Candy box with as many customizations, fill it with colorful candies and wait for that special day when you will absolutely stunt him/her with this stuff of simplicity. However, if you are looking for more decoration, making flowers and sticking on this present can also be a great choice. Click here for the Tutorial. Candies have a million decorative usages if we truly want to use them to their highest potential. For instance, the candy heart Marshmallow Pops are yet another creative DIY for your partner. This DIY will revive your childhood memories from their cute marshmallow attached to the stick and different colorful hearts hanging on them. Your partner must have surely not expected this gift from you and which will be the reason for them to jump of excitement and joy. Click here for the Tutorial. Whether or not you have a garden, this DIY will smell in your love to your partner along with the winds. 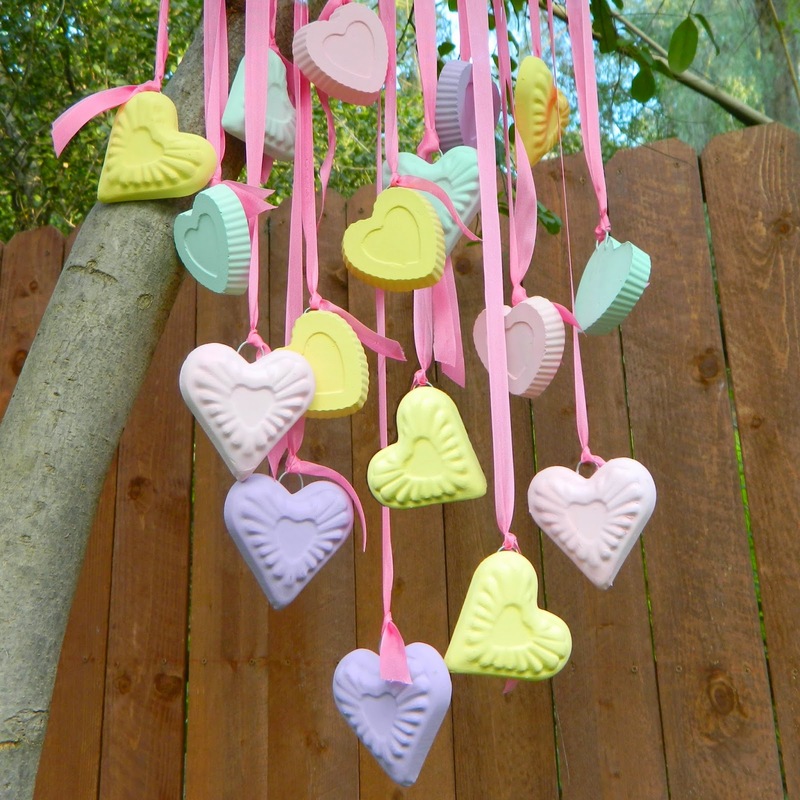 Candy Hearts Wind Chime is the perfect gift which you can create for your loved one. Its creation is unique and that is what makes it different from any other DIY gifts. Every one of us loves some out of the box gifts and this DIY is definitely one of them. Take some time, invest in this gifts making and spread your love in the form of winds. Read the Tutorial. A Bouquet of flowers has been a tradition but a bouquet of Candy? It’s a revolutionized move in the gift making. This Valentines, make your other half feel special with this majestic and unique DIY. Fill your bouquet with some colorful and attracting looking candies and spark the light of love and happiness all over both of you. Making of this DIY is absolutely easy and you will enjoy this time filling those candies with your love in that bouquet. Read the Tutorial. A valentine’s day full of sparkles all over is the one which can make our loved ones face filled with joy and happiness. Taking this to the next step, the Glitter Heart Candy Boxes is a gift which will surely be loved by your soul mate. In this DIY, you can glitter the whole box with some fantastic colors, shape that box in a magnificent shape and fill in with some candies and make it a perfect appealing gift for him/her. Read the Tutorial. A bouquet of flowers will bring a sense of smile on your face but a bouquet of candies will outshine your happiness from your face. Seeing those differences, making a Candy Bouquet will be a unique gift to give to your soul mate in terms of happiness. You can include candies of different colors, flavors, mount them in that bouquet and flaunt your partner to the highest possible extent they could have ever dreamed off. Read the Tutorial for its making. All of us must have made different candy boxes, but making an origami candy box is a bit different than the rest. This DIY requires some skills but once made and presented into your partner, it will make them feel the warmth and cherished by this majestic gift from you. In addition, you can decorate this gift with some colorful art and add in the favorite candy of your partner. Well, trying to outperform your skills on DIY, Click here for its making. There is no need for a gift being bulky and expensive, true love can be expressed by just a mere small gift and the same is with Valentine’s Day Candy Grams. This unique DIY is small but can make your partner think of your importance in his/her life. It can be made within minutes and requires no kind of extra effort or money. This DIY is an example of simplicity and can be further decorated with a range of customization options. Read the Tutorial. Not many people need some expensive and bulky gifts which involve some hefty money. Those Valentines love moments can be made special with some simple yet unique candy gifts which are shown above. Try out on each of the DIY’s and make this Valentine’s Day of your as well as for your partner, a never-ending experience, mesmerizing every inch of it in your afterward life.